A judge gave a serial drink-driver a chance to avoid jail because she is a woman. 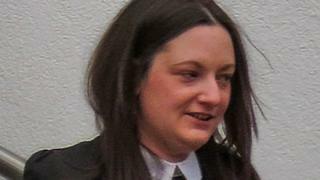 Victoria Parry, 30, hit three other cars after downing a bottle of wine. Judge Sarah Buckingham said Parry, an alcoholic who had escaped an abusive relationship, would have gone “straight down the stairs” to jail if she were a man. Although Parry “deserved” a prison term, the judge gave her three months to address her issues. The comments are being investigated by a judicial watchdog. Prosecutor Tim Sapwell said Parry caught a van’s rear bumper, a Vauxhall Insignia’s wing mirror, then the side of a BMW “very heavily” in the crash. He told Warwick Crown Court it caused her Fiat to spin off the A46 near Stratford-upon-Avon into a wooded area where it caught fire. An off-duty police officer pulled her from the car, and Parry, who was banned from the road at the time, told him she had drunk a bottle of wine and “shouldn’t be driving”, Mr Sapwell said. She was arrested, and registered a reading of almost three times the legal limit at a police station. Lucy Tapper, defending, said Parry had a “considerable drink problem” after a 15-year abusive relationship, but had begun to tackle her alcohol intake. But, she said, the offence had been committed in May 2018, and Parry, who had admitted dangerous driving, had not been in trouble since. “She has clearly got an alcohol problem. She is, whether she admits it or not, an alcoholic,” the judge said. Deferring sentencing for three months, judge Buckingham told Parry she “richly deserved” an immediate custodial term of 18 months. “I want to see whether you can really address the issues rather than paying lip service,” she said. She ordered Parry to abstain from alcohol, attend Alcoholics Anonymous meetings, and pay for private counselling. If Parry complied, she said, the custody would not be made immediate. “If you don’t comply, I will conclude that you are not worthy of the chance,” the judge added. The Judicial Conduct Investigations Office confirmed it received a complaint about the remarks attributed to the judge.